All core drilling machines with a 1⁄2" (12,7 mm) (F) connection. 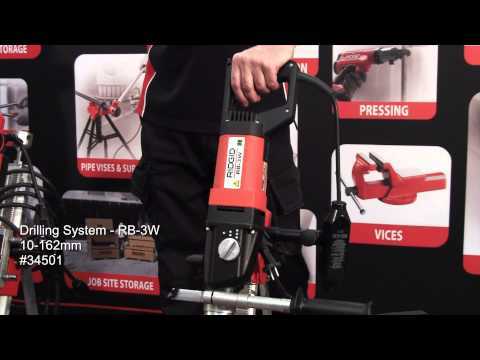 Current RIDGID models: HC-2, HC-2W, RB-3W. 42356 350 32 3/8 x 1/4 x 1/8 in. 42366 350 40 5/8 x 1/4 x 1/8 in. 16 x 6 x 3 mm. 42376 350 52 5/8 x 1/4 x 1/8 in. 42386 350 60 5/8 x 1/4 x 1/8 in. 42396 350 65 5/8 x 1/4 x 1/8 in. 51646 350 72 1 x 9/32 x 5/32 in. 24 x 7 x 3,5 mm. 51656 350 78 1 x 9/32 x 5/32 in. 51666 350 82 1 x 9/32 x 5/32 in. 51676 350 91 1 x 9/32 x 5/32 in. 51686 350 102 1 x 9/32 x 3/8 in. 24 x 7 x 4 mm. 51706 350 112 1 x 9/32 x 3/8 in. 52876 350 42 5/8 x 1/4 x 1/8 in. 52886 350 57 5/8 x 1/4 x 1/8 in. 52896 350 62 5/8 x 1/4 x 1/8 in. 52936 350 127 1 x 9/32 x 3/8 in. 64316 350 132 1 x 9/32 x 3/8 in. Sizes up to 30 mm are also suitable for wet drilling from a stand. 52066 32 350 1/4 x 1/16 in. 52076 40 350 1/4 x 3/32 in. 52086 52 350 1/4 x 3/32 in. 52096 72 350 1/4 x 3/32 in. 57296 35 350 1/4 x 1/16 in.